With Valentine’s Day right around the corner, we certainly have date night on the mind. To some, going out with a loved one is a full-on production: dinner, drinks, tickets to a show. To others, splitting a six-pack and watching the latest docu-drama is all the romance they need. To each their own. Whatever your plans, we have an outfit that’ll keep your date engaged. If date night is your excuse to go big, then do it. 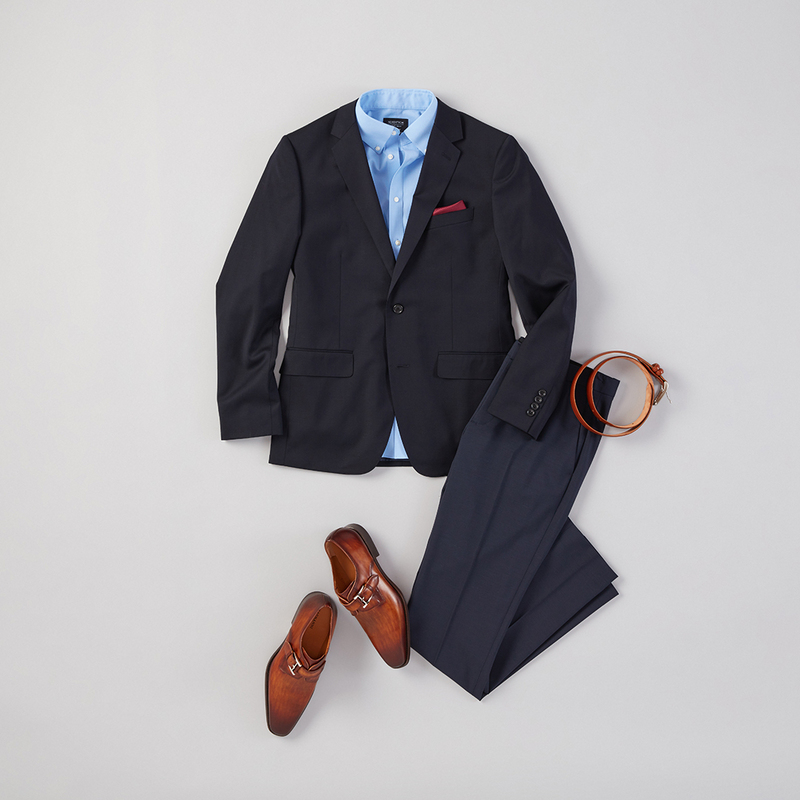 A tailored suit in navy or grey is the place to start. 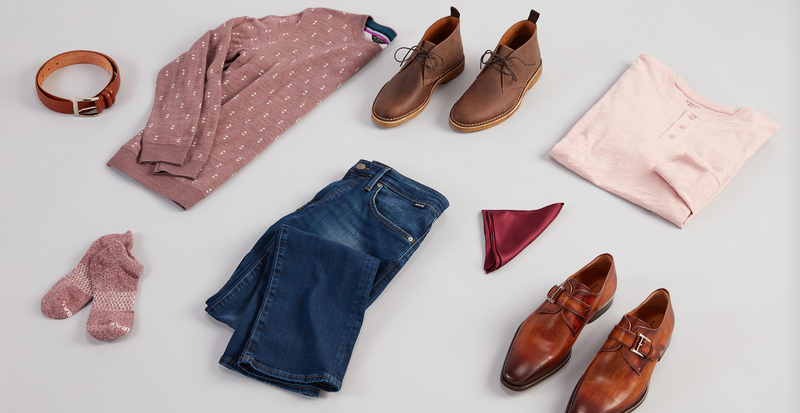 You can absolutely go with a solid-colored shirt, but we think a pattern, however slight, adds some depth. But wearing a suit doesn’t mean you’re stuck with a tie. A pocket square adds just enough polish for even the most ambient four-star restaurant. Winter date nights can be tricky to navigate. How do you stay warm while looking cool? Layers, and lots of them. We even added a little bit of holiday flair with this toned-down pink cashmere sweater. 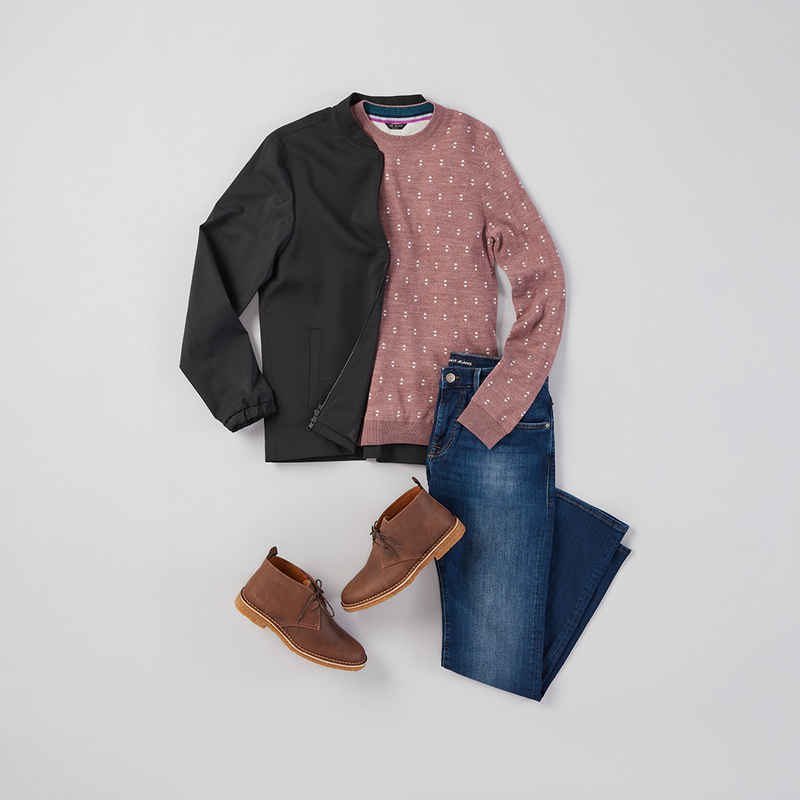 The key to keeping this look casual-cool is the bomber jacket. It’s much less formal than a sport coat, and it’s a bit edgier than a cardigan or jersey blazer. To complete the look, toss on jeans and boots. To protect your leather boots from salt—or if you need help cleaning them off—see our post on caring for leather. Sometimes, date night means ordering food and watching a couple of movies. For that, let’s go ultra comfy—joggers and zip-ups are where it’s at. Sweats are pretty standard, but don’t side-step the details. Pants with a drawstring are great if the last piece of pizza is calling your name, and a zip-front hoodie lets you regulate temps a bit better than a pullover. Also, shearling-lined slippers with a rubber sole make great house shoes when it’s chilly, or in case you need to brave the cold to meet your delivery guy outside.